In the front of the farm, cocoa trees grow in a symbiotic relationship with betel nut palms, while in the back, cocoa beans are directly processed into chocolate. Emerging cocoa producer Taiwan can thus be said to provide the shortest distance from tree to bar. The fruiting cocoa trees of the plantation are laden with cocoa pods in a variety of colors, indicating different stages of ripening. Green, red or purple pods turn orange as they mature. The pods hang at a height that allows them to be easily picked with an outstretched hand as one walks down the rows. Although it is a hot day with temperatures around 30 degrees Celsius, it does not feel that hot thanks to the shade from the towering bet nut palms and an occasional breeze. We are not in Central or South America, where cocoa originally came from, but in Southern Taiwan’s Pingtung County, an emerging production area on the global confectionery map. Cocoa trees, which thrive in hot, humid weather in shady spots with little wind, mainly grow in the region spanning about 20 degrees north and south of the Equator. In Taiwan, the Mt. Dawu mountain range, with its clear water, and the Wanluan and Neipu areas in Pingtung County offer good conditions for cocoa cultivation. Chen Li-ping, head of the Department of Hakka Affairs of the Pingtung County Government, jokingly notes that cocoa trees love the sunshine but don’t like to get tanned. Therefore, the taller betel nut trees provide protective shade with their fronds. During the typhoon season, farmers will tie the cocoa trees to the betel nut palms to prevent them from toppling. Nowhere else in the world will you find this rare sight of cocoa trees growing in a somewhat symbiotic relationship with betel nut trees. When people hear of Taiwanese cacao, their first reaction is usually an incredulous “Taiwan is growing cocoa?” Wei Sheng-teh, section chief at the Tainan Branch of the Council of Agriculture’s Soil and Water Conservation Bureau, points out that over the past decade or so Taiwan’s cocoa cultivation acreage grew from zero to around 300 hectares. Cocoa from Taiwan is five to seven times more expensive than cocoa from other production areas, but it is also a high-end product. As Lin Li-ping, a young farmer in Wanluan, takes us into her cocoa plantation, she tells us that she began to plant cocoa trees at the recommendation of other farmers. In the early stage, her biggest problem was finding buyers. “I didn’t know where my buyers where. In the past I grew fruit, so I knew where to sell them, be it guavas or bananas. But growing cocoa meant taking a risk. How to grow it, where to sell it? There were so many uncertainties,” Lin recalls. After a trial-and-error period, Lin gradually figured out what made the trees grow well, and she saw her plantation thrive. “I am convinced that a few years down the road, the economic value of cocoa and its yield will be higher than for betel nuts,” she predicts, displaying the optimistic determination that is most farmers’ second nature. The International Chocolate Awards (ICA) are for chocolatiers what the Academy Awards are for the film industry. In last year’s competition, several Taiwanese chocolate brands, including Fu Wan Chocolate and Le Ruban Chocolat, shined with great results. This September, the ICA held its Asia-Pacific competition for the first time as an independent event in Asia, picking Taiwan as host. This year, more than 700 products from some 100 chocolate companies from 16 countries in the Asia-Pacific region were entered. Taiwan’s chocolatiers came away with even better results than last year, winning nine gold, 30 silver and 29 bronze medals. Why did the ICA pick Taiwan as its first host in Asia? Martin Christy, judging director of the ICA, explains that most crucial for the decision was that Taiwan boasts cocoa production, chocolate-making facilities, and a market with purchasing power, all in one place. A look at the world map shows that the major cocoa production areas are in Africa and Latin America, whereas chocolate production and consumption takes place in countries located at higher latitudes. Christy remarks that a place like Taiwan that can produce cocoa but also possesses quite mature chocolate-making technology is hard to find. Not hiding his surprise, he recounts a visit to a cocoa plantation in Pingtung, where he saw cocoa beans being dried in the sun in the front of the farm, while sorting, roasting and grinding was done in the back. Here is probably the production area with the shortest processing mileage in the whole world,” Christy says. On top of that, Taiwan has a large consumer market. The Taiwanese are very open to different culinary cultures and savor the good things in life. It is very rare that a place provides all conditions from production to technology and consumption at the same time. A complete gourmet environment requires cultivation and production capability, chocolate-making skills and the sensory skills to taste product on a professional level, which requires the devotion of human resources and efforts in each area. Taiwan’s craftspeople and artisans have been shining in various contests in the past. But this time, Taiwan provided the stage for high-quality confectionery, displaying its soft power. Tea-flavored chocolate products from Taiwan did particularly well this year, becoming a hit with jurors. Monica Meschini, a member of the European Permanent Jury, who is both a chocolate and a tea taster, notes, “This is the first time that I’ve tasted such great chocolate, such good tea.” Meschini fell in love with the great flavors of the tea series. This year, Fu Wan Chocolate won a gold medal with its Tie Guan Yin Tea-flavored dark chocolate bars. Fu Wan Chocolate CEO Warren Hsu says he selected suitable tea flavors by taking a sip of tea and then taking a bite of chocolate. As a result, he found that partially or fully fermented teas with a stronger body and fuller flavor such as Tie Guan Yin and charcoal-roasted Oolong teas and Ruby (also known as Red Jade) black tea go particularly well with cocoa. The gold medal-winning tea-flavored chocolate bar Taiwan No. 1 contains 62 percent cocoa grown in Pingtung County, married with Tie Guan Yin tea from the Muzha region in Taipei. It carries notes of dried tropical fruits such as a slight guava flavor. 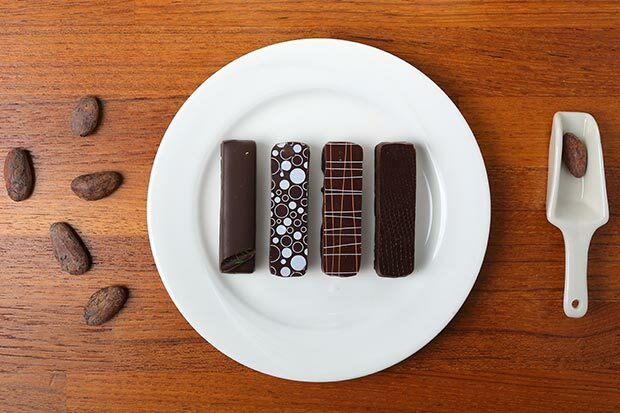 As the chocolate slowly melts in the mouth, a subtle orchid flavor evolves in the finish. This wealth of changes in texture and flavor from the beginning to the end fascinates both the Taiwanese as habitual tea drinkers and foreigners who appreciate Eastern culture. The Taiwan Charcoal Oolong Tea 62% chocolate bar, which won a silver medal and is the favorite of FIH Regent Group Chairman Steven Pan, charms the palate with ripe fruit notes and a smoky flavor. Le Ruban Chocolat, a patisserie in Taipei, won a gold medal in another category with its white chocolate roasted oolong tea truffles, which deftly pair the creamy flavor of white chocolate with Oolong tea from Hualian on Taiwan’s east coast. “Chocolate is a lingua franca in the whole world. And I want to find a path to the world stage,” remarks Hsu, who used to be a food consultant. A trip to Florence, Italy many years ago, where he tasted chocolates, developed a myriad of changing flavors in the mouth, inspiring Hsu to delve into researching the craft of chocolate making. He even flew to London with his wife Lin Wan-ting to gain a thorough understanding of chocolate flavors. They went on to become the first Taiwanese to obtain certificates in chocolate tasting from the International Institute of Chocolate and Cacao Tasting (IICT) in the British capital. 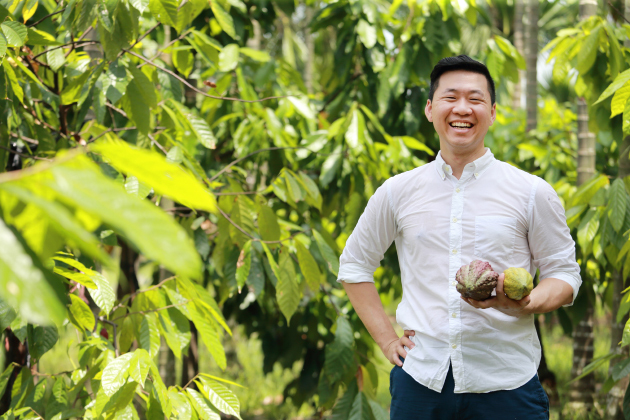 As a skilled chocolate taster, Hsu knows how to trigger chocolate eaters’ “taste memory”, which not only helps his products stand out in competitions but also enables them to stand the test of the market. Most large chocolate manufacturers buy cocoa butter and cocoa powder directly and mix them based on their formulas. 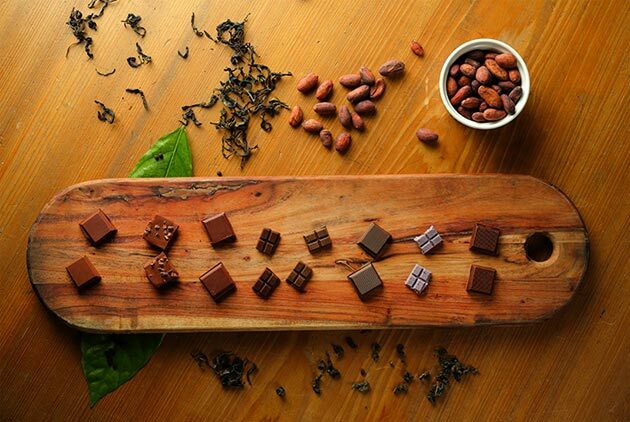 High-end chocolate makers emphasize their “bean to bar” processes, which means they buy cocoa beans and ferment, dry, roast and grind them themselves for their chocolate products. Fu Wan Chocolate controls the entire process from an even earlier stage, the cocoa bean production. 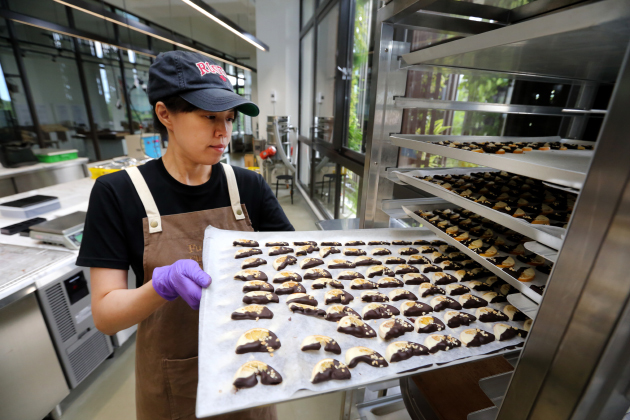 Consequently, they call their all in one process “tree to bar.” Only a handful of Taiwanese chocolate brands use tree-to-bar chocolate making. Hsu observes that Taiwanese farmers are good at taking care of their crops. As a result, the taste of Taiwanese cocoa is “particularly nice and energetic, like the Taiwanese people.” Noting that Taiwanese cocoa carries caramel or berry notes and a very balanced flavor, Hsu believes it is very suitable for seasoning or in combination with other foods. However, in comparison with traditional cocoa producers in Africa and Central and Latin America, whose plantations are around 30 years old, Taiwanese cocoa trees are young, at an average of just ten years. Beans from younger trees do not contain enough sugar, which is reflected in the acidity of the resulting cocoa powder. Hsu, however, has made a virtue of necessity by adjusting the fermentation and roasting process to bring out the local flavor. He invented a “double ferment” method that is unique in the world, fermenting the cocoa beans twice to make “Taiwan No. 9” chocolate, which won a gold medal for its strong rosé champagne flavor with red wine vinegar and berry notes. “Taiwan has a lot of farming talent, and our next step will be to sign production contracts with [cocoa] farmers, while we concentrate on technology development,” explains Hsu. 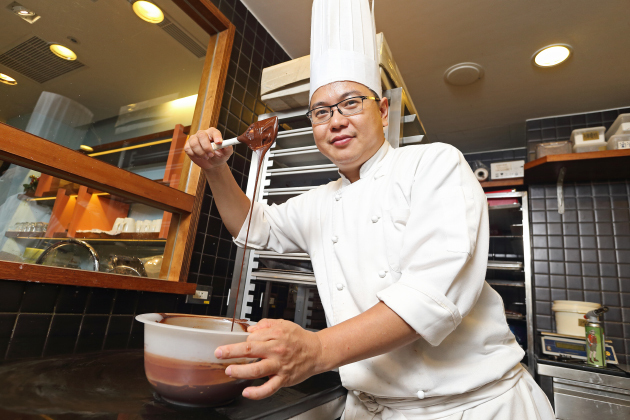 “What language can we use to communicate with the whole world?” is the question Le Ruban Chocolat chef Hugo Lee, who looks back on 26 years of patisserie experience, has been asking himself all his professional life. “French confectionery customarily combines hazelnut, raspberries and almonds. In the case of Japan, matcha and yuzu have already become a common language in the international food and beverage scene. But what about Taiwan? I want to use local food ingredients to try to make a chocolate that represents Taiwan, to catch up to the rest of the world,”remarks Lee. Therefore, Lee uses floral flavors to interpret the taste of Taiwan. Last year, he chose chrysanthemums from Mt. Chike in Hualien County. This year, he tried longan flowers in combination with honey from Taitung County to make dark “longan flower” truffles. Under the cocoa coating, the smooth and rich floral flavor of the ganache comes across as much more elegant than fresh and sweet longan fruit. So it should not come as a surprise that the new creation fetched a gold medal.